Mumbai: In another pointer to suspected Students Islamic Movement of India, or SIMI-Indian Mujaheedin involvement in terror attacks in New Delhi and other parts of the country, Mumbai police on Wednesday arrested five persons, including the man who made bomb circuits used in the blasts in the national capital. Mumbai commissioner of police Hasan Gafoor said the next target was Mumbai. The five arrested have been identified as Afzal Mutahib Usmani, Mohammad Saddik Shaikh, Mohammad Aarif Shaikh, Ahmed Zakir Shaikh and Shaikh Mohammad Ansari, all of whom hail from Azamgarh in Uttar Pradesh. 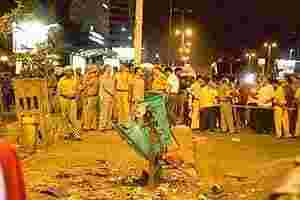 The five are suspected to be involved in Sankatmochan temple blast, blasts on Mumbai trains, attacks on courts in Lucknow and Faizabad, explosions in Hyderabad, Bangalore, Jaipur and planting unexploded bombs in Surat. Also, Aarif was the one who made the bomb-circuits which were used in Delhi blasts and was allegedly in “close touch" with Atif, the head of Indian Mujaheedin and suspected mastermind of Delhi blasts. “All the five arrested were involved in all the blasts across the country since 2005," Joint Commissioner of Police (Crime) Rakesh Maria told mediapersons here. While Usmani was arrested in Azamgarh, Saddik has been held in north-east Nehru Nagar in Mumbai, Aarif from north-east Kurla, Ansar from north-east Chembur and Zakir from Bhiwandi in neighbouring Thane district. Ansar, a software engineer by profession, was responsible for assembling the bombs.